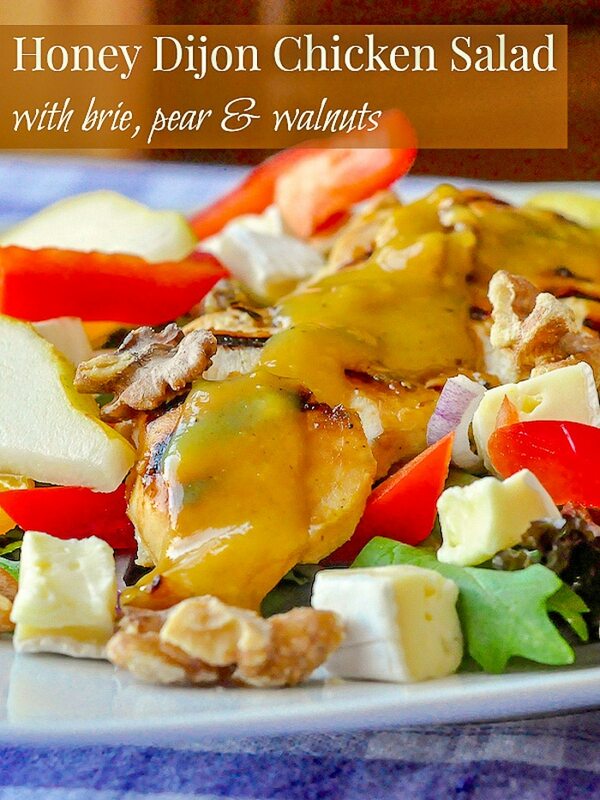 Honey Dijon Chicken Salad with Brie, Pear and Walnuts. A bright fresh grilled chicken salad full of bright flavours and textures. One of my favourite ways to turn a great healthy salad into a full and satisfying workday dinner, especially during grilling season is to add something tasty off the grill to an interesting mix of salad ingredients for a delicious mix of tastes and textures. 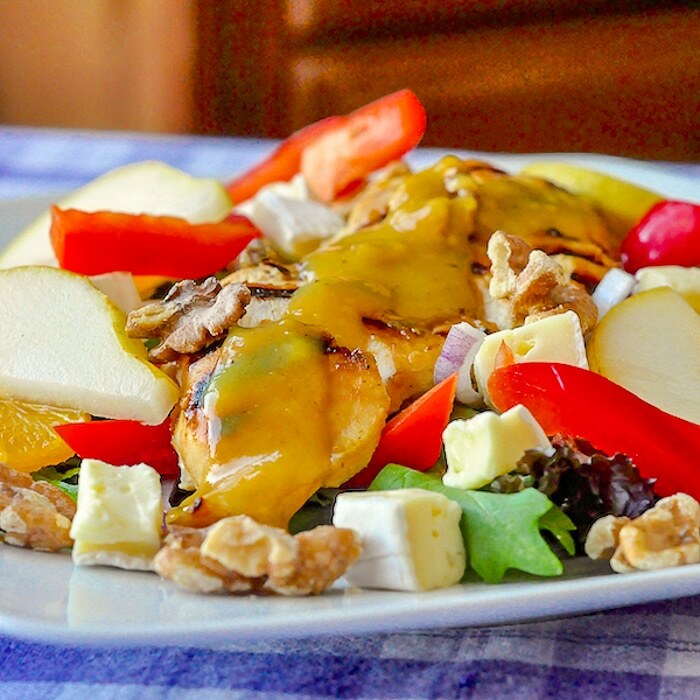 This one was particularly good when we added Honey dijon chicken to a terrific salad that included ripe fruit, creamy brie and crunchy toasted walnuts; a fantastic mix and one I’ll definitely be making again. Deboned chicken breasts for Honey Dijon Chicken Salad with Brie and Walnuts. 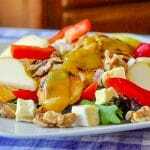 Like this Honey Dijon Chicken Salad recipe? 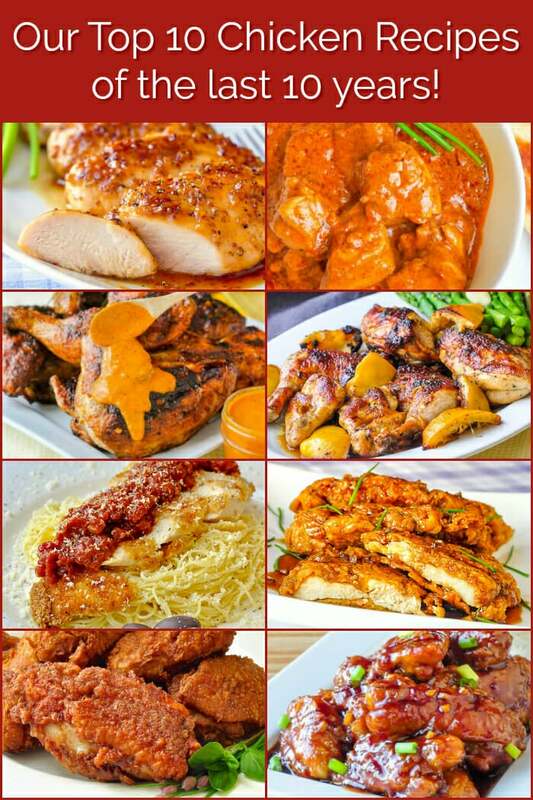 Mix all the marinade ingredients together and rub onto the chicken breasts. Let marinate in the fridge for a 1/2 hour while you make the Honey Dijon Glaze. Simmer the honey, mustard,vinegar, ginger, salt and chicken stock together in a small saucepan for about 10 minutes before thickening with a slurry of 1 rounded teaspoon of corn starch dissolved in 3 or 4 tbsp water. Simmer for only about a minute after adding the thickening, stirring constantly. Grill the chicken until fully cooked, brushing it with the glaze several times in the last few minutes of cooking time. 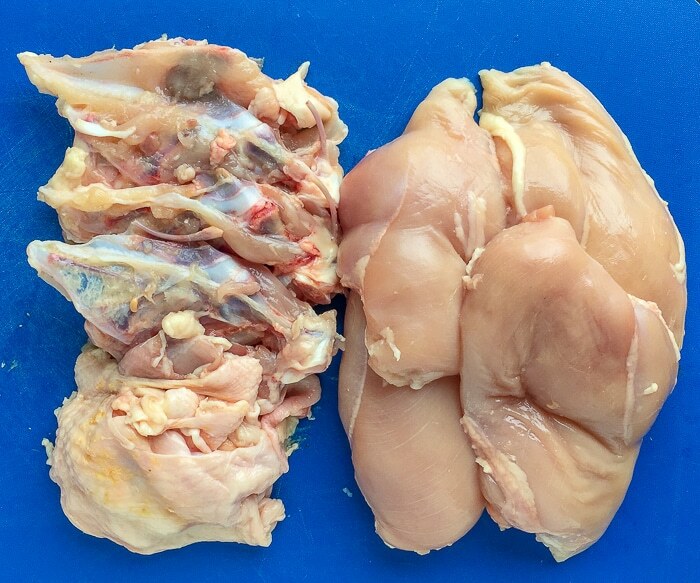 Slice the cooked chicken and serve it on the prepared salad. Serve remaining glaze over the chicken.